We Tried The Fitness Band That Shocks You Into Breaking Your Bad Habits -- And It Hurts! 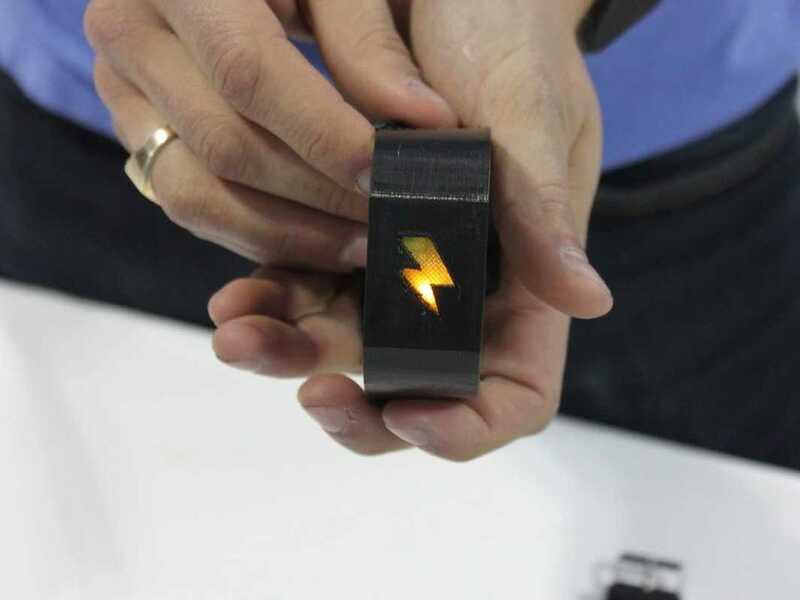 Lisa EadiciccoBusiness Insider’s Steven Tweedie also tried on the Pavlok. Most fitness bands claim that they want to help you change your habits and get in shape. But none of them actually go so far as to physically punish you for slipping up on your goals. 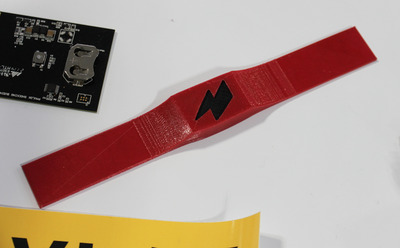 That’s where the $US149 Pavlok wristband comes in. The Pavlok, created by startup Behavioural Technologies, uses negative reinforcement in the form of a subtle shock to train your brain. Behavioural Technologies CEO Maneesh Sethi told us all about the psychology behind his company’s wristband and how it works back in July, but at this year’s Engadget Expand, we actually got to try the wristband firsthand. The version we tried was just a prototype, but the real thing should start shipping in April for Indiegogo backers. Those who preorder the device at a discounted price at Engadget Expand will get theirs in January. Here’s an idea of what the final version will look like. 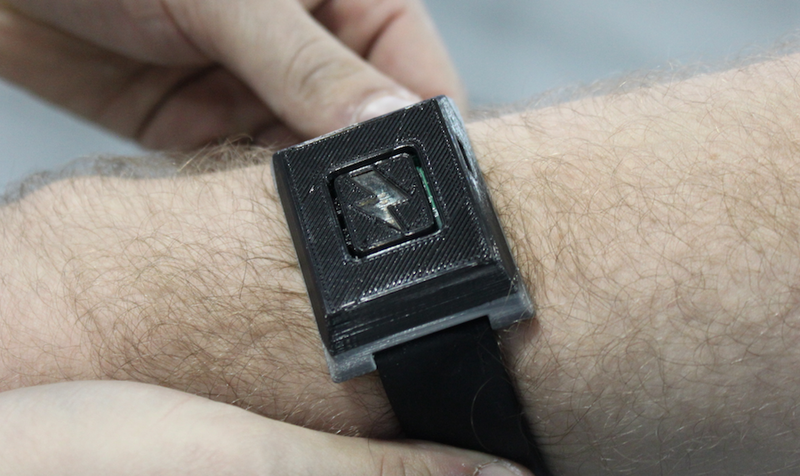 Lisa EadiciccoHere’s what the final version of the Pavlok might look like. A representative at the Pavlok booth strapped a prototype around my arm. Without warning, he tapped the zap button in the wristband’s accompanying app and sent a shock to my forearm. The shock feels like a small pinch, and while it’s not really painful — it’s certainly not pleasant. Don’t expect to feel an intense vibration or buzz when wearing the Pavlok; rather, the sensation feels like a quick, sharp pinprick. The unit we tried was only set to 40% in terms of intensity. The Pavlok representative that gave us the demo said he wasn’t allowed to let us try the highest setting just yet. Lisa EadiciccoAnd here’s another version in red. You can wear the Pavlok band on either your forearm or your wrist, but you’re likely to feel the shock a bit more on your forearm. If you want, you can also take the sensor out of the band and wear it directly on your skin as shown below. You’re likely to feel the shock more prominently if you choose to wear it like this. Lisa EadiciccoA Pavlok representative was wearing the sensor directly on his skin. The idea behind the Pavlok is to create motivation for wearers to achieve certain goals. Within the Pavlok app, you can set a goal for yourself, such as exercising on a regular basis or learning a new language. The app will then assess your goal and break it down into actions you can perform every day. If you miss your goals, however, your friends can punish you through the app by forcing you to pay a fine or by issuing a small shock. It sounds like your friends will be responsible for shocking you through the app, but there’s also an alarm app that will work with the bracelet. If you snooze too many times, the band will zap you into waking up. Other than its ability to issue small shocks, the Pavlok can track your steps, activity, and sleeping patterns.